Ovaro is our German born, bred, and trained sire with an incredible pedigree. He holds German SV pink papers and has achieved the top quality V6 rating. He is a good sized male at 65cm and 85 pounds. His hips and elbows are certified, HD- normal, ED- fast normal, with a breed survey KKL- AKD. 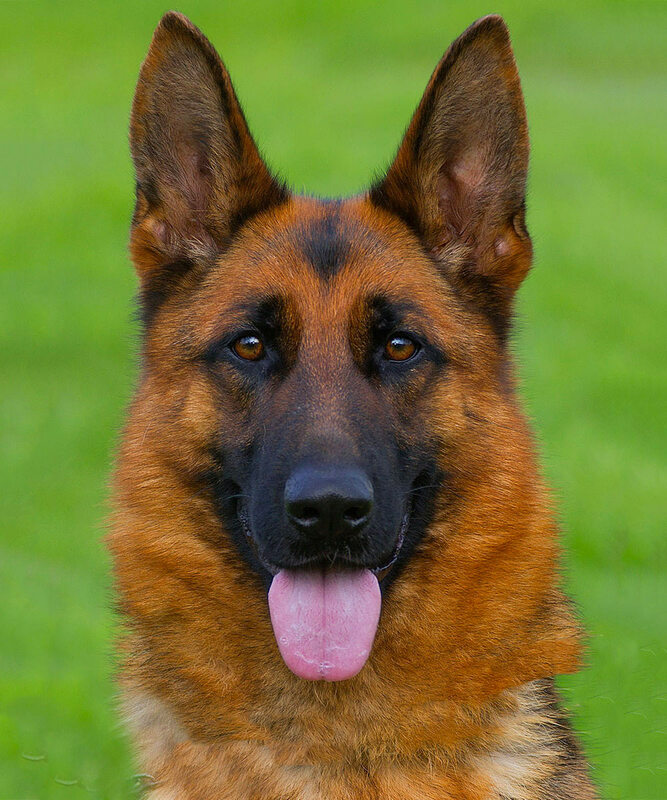 He comes from a renowned German kennel where he was professionally trained in BH, AD, IPO1, IPO2, and IPO3. He is a proven sire that produces beautiful dark sable pups. 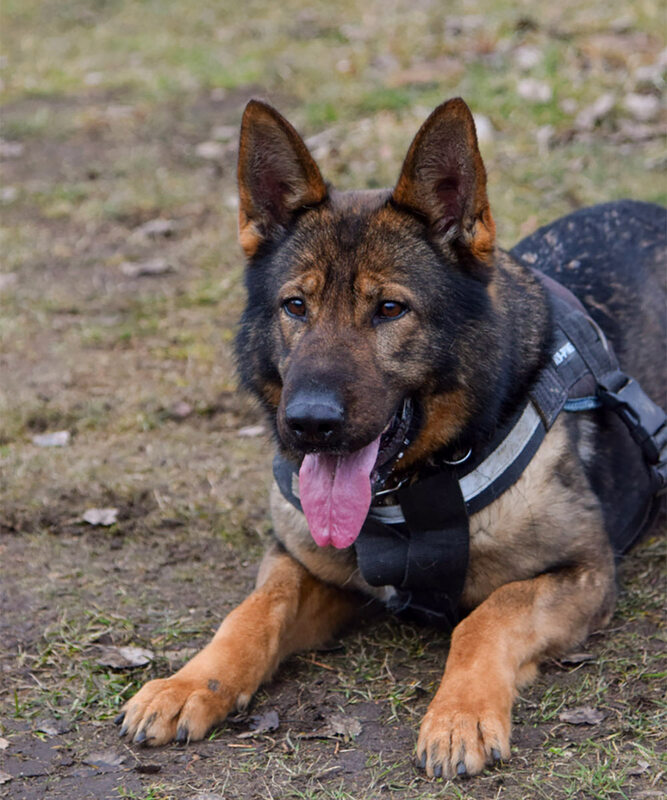 He is an incredible working dog with intense focus and obedience, as well as being a loyal and loving family dog. 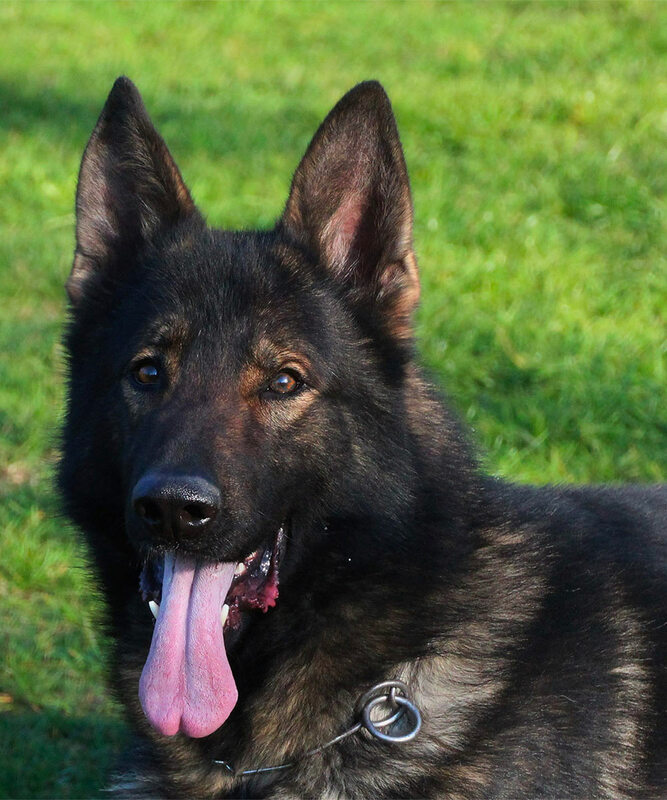 Franzi comes from Germany with an incredible pedigree. Two of her ancestors hold double WUSV Universal Sieger Championship titles. This is almost never seen in a dog's pedigree. She holds German SV pink papers and was professionally trained in Germany where she achieved BH, IPO1, and IPO2 training. She exceeds at both obedience and bitework; and has a fierce, unrelenting drive and focus. Her hips and elbows are certified, HD- normal, ED- normal. She is an incredible girl, that produces champion bloodline pups. Tesy is a lovely, black and tan proven, Czech imported female. She holds four working titles including BH, IPO1, ZVV1, and ZVV2, which is a high-level accomplishment. Tesy had impressive scores of 97 in tracking and 95 in protection in her ZVV2. She has excellent x-rays and was breed surveyed at KKL. She has an impressive pedigree of outcrossed lineage. She lives to please and loves to work. At six, she acts more like an active pup than a full grown female. Her temperament is impeccable - sensitive and biddable. She bonds strongly to her handler and loves praise. She is kid and dog friendly, and very environmentally stable, all of which will be passed down to her pups. Easy is an incredible girl that holds the following titles; SG-1, BH, AD, IPO1, and is breed certified KKL. 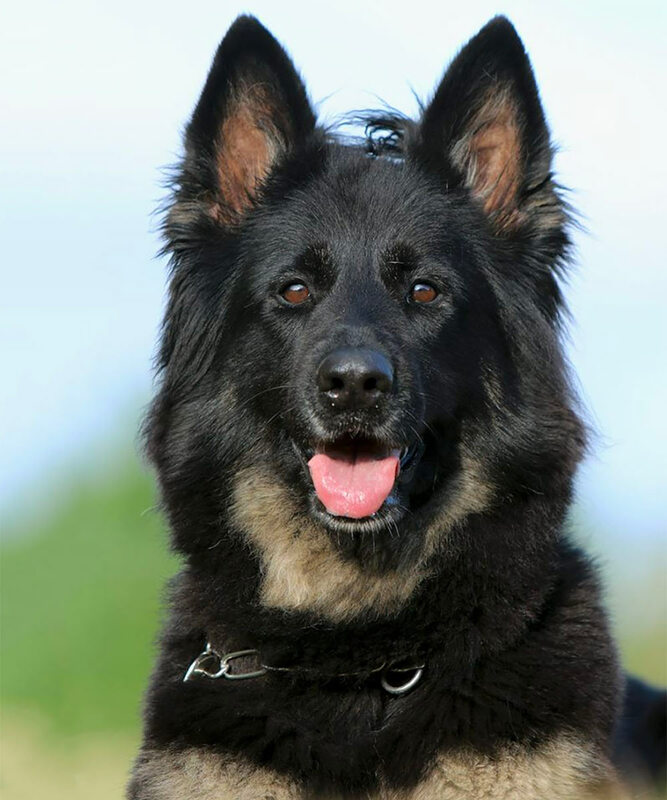 She is a large, solid, and powerfully built black & brown shepherd with a beautiful full coat. Strong head with highly intelligent expression. Correct structure, great bone strength and fantastic muscle tone. Self-confident with nerves of steel; nothing can shake her. Highly trainable, dependable and very willing to respond to anything asked of her. She achieved all of her performance awards possible at just two years old. Naturally social and sure in every situation. Shows natural desire to track with excellent desire to overcome and solve problems on her own. Loves to retrieve and play with a ball. Powerful and sure in protection, intimidating guarding with full hard grips on the sleeve. Received pronounced courage ratings in every competition. 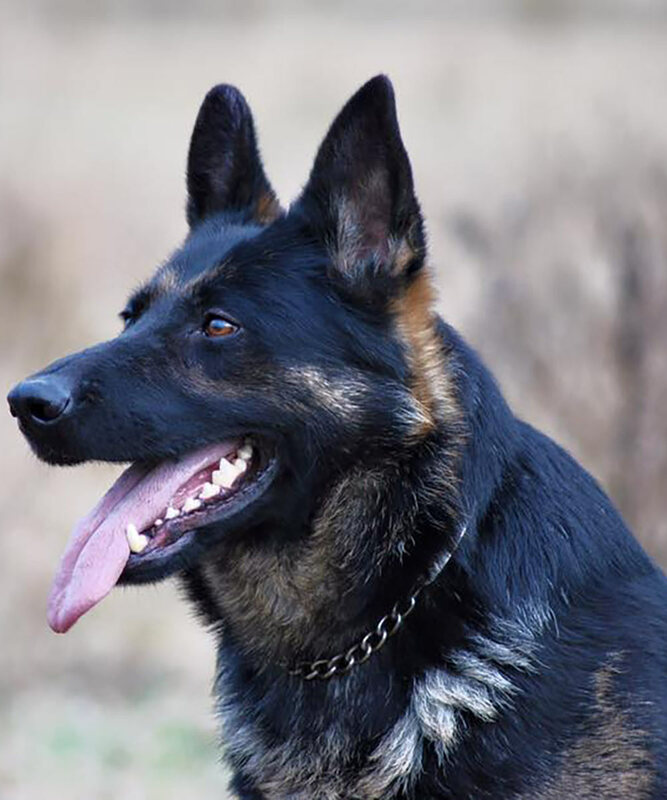 Well-known working line combination of top Schutzhund performers known for optimum health and vitality. Sire is V rated Crok von der Mordersdell. Lines to Branko Salztalblick and Uruk vom Schwarzen Milan. Mother is Rusty vom Alaska with lines to Drago vom Patriot. Hips and elbows certified a1. Titania’s mother, Nami vom Mittelwest, was sent to Germany where she was bred to Leo von der Zenteiche, and brought back to the U.S. to whelp her litter. Titania is a gorgeous deep red and black female with a heart of gold and she comes from an impeccable pedigree. Her father, Leo, is a VA1 Sieger title holder. He also achieved working titles including IPO3, and has a breed survey of KKL. Her mother earned V1 placement, as well as working titles up to IPO3. She also has a breed survey of KKL. Titania achieved a V rating, and holds titles in BH, AD, and IPO1. She has been DNA tested and is DM clear with hips and elbows rated A normal. Titania has outstanding anatomy and movement with a beautiful head and expression. She is very social, loves children, and is just an overall happy female with a fun personality. Titania has been an excellent mama yet can still hold her own in protection work. She is the epitome of even temperament and fierce working drive.